During one of my previous posts I discussed standing at work. 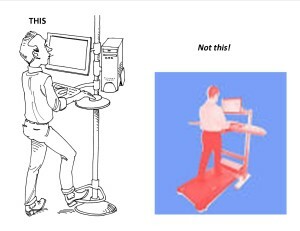 Since then people have asked if varying your posture is so good for you how about using a treadmill while I work? Have you seen or read about walking desks? Walking desks are a fad that will hopefully go away soon. Not only do the pose a safety risk, many people have fallen or tripped while typing, but they also decrease productivity. The human brain is not meant to multi-task. When doing more than one thing at a time the mind is actually switching back and forth between the multiple tasks at hand. Some brains are just faster at going back and forth which is why some people think they can multitask. Walking while typing also increases levels of fatigue which in turn also decreases your productivity. No matter how slow you go, walking all day will take its toll. A sit/stand desk allows the user to vary their posture throughout the day a standing desk only allows you to vary which foot is in front you can’t take the stress of your knees and back.